As you know we can set a password to our computer, so to start computer we need type the password which every computer user knows, But do you ever heard about it that you can lock & unlock your pc using a USB? If not then here we are going to tell you and show you how you can lock or unlock pc with usb. This is not any new trick, In-face this is an old pc trick to secure your personal data, but most of people don't know about this useful trick.But your time of unawareness is over now! because here we are, to show you this useful trick to lock your pc with usb. We will use a little Free software in order to lock or unlock computer with a usb. The software we need is called "Predator", This is a free tool for which you don't need to pay anything. (A Paid Professional version is also available, but the Free/basic is enough for your work). 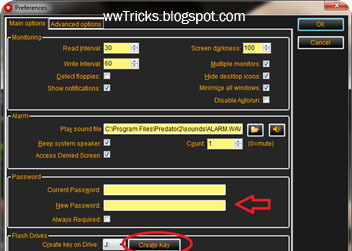 After installing this Free tool, connecting USB device and setting up a password(Steps are given below), For the next time after every 30 seconds it will check whether the USB is connected or not? So if you Un-plug your USB, system will locks automatically and after pluged-in again you'll see the system unlocked. Also If someone tries to unlock your pc with the wrong password, will play an alarm and will notify you by SMS or E-mail about this attempt. In order to lock your pc with a USB Follow the below instructions. STEP-1: First of all Download this free tool "Predator" and install on your pc. STEP-3: Now 'Predator' will exit/ So Click on 'Predator Icon' from the taskbar and try to un-plug your USB device, See really your pc locks or not? tell us int the comment box. In case if your USB device got corrupts or lost! then no problem another way is to Unlock your computer is to Enter your password. This will not delete/corrupt any of your files stored in your USB device so feel free to use 'Predator'. Thanks Ankit Sharma for dropping your comment here! This is really nice but please tell me, what happens if someone formats my usb? Nothing will be happens, Still if anything goes wrong you've to enter the password!